So, more often than not, I while away my non-class time at school flopped on the green room couch with a book. And, without fail, someone will ask me whether or not the book I'm reading is any good. When it came to this one, I very distinctly remember being 70 pages in and going "Eh, I'll give it a bit longer to see if it finds its plot." The book did indeed find its plot, but there were only two reasons I kept going to the end on this one. The first was that at that point I'd already invested 100 pages of time into it (of a 360 page book,) and the second was that I'd failed to bring another physical book with me and forgotten my glasses so I couldn't do any actual reading on my ipad for any length of time. Eyesight's a weird thing sometimes. I'm still getting used to that whole needing glasses things. There isn't a lot worth reading in this book. It had a lot of potential to be something decent and the writing itself was pretty strong but the story? Eh. Pass. I mean, I have a history of making fun of YA character names. There's a sarcastic dystopian trilogy I have half plotted out that involves the dramatic life of Velveeta and her love affair with the dashing and debonair Stapler. 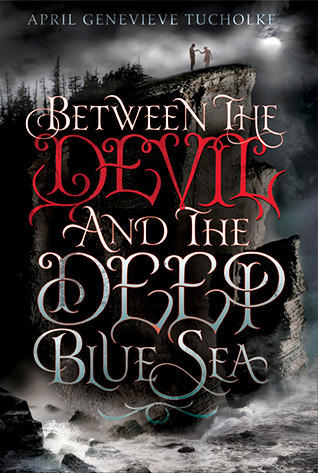 Between the Devil and the Deep Blue Sea takes the odd YA naming conventions and runs with it to the point where it's hard to take anyone seriously. Especially when the MC spends a good chunk of her time demonizing her twin brother for being a misogynistic scumbag and then goes right on ahead shaming her bff for being totally okay with her own sexuality because of course what Sunshine does with her body is absolutely Violet's business and place to judge. A plot that takes nearly 100 pages to get going isn't worth my time. Point blank. The first chunk of the book is Violet talking about wearing her grandmother's old clothes and how hard it is being a boho artist from old money that doesn't exist any more and boo hoo nobody likes her family because they're entitled recluses. The Love Interest shows up nearly immediately, and maybe it's a sign of my age, but I'm definitely kind of annoyed that some guy shows up to rent the guest house at Violet's sprawling estate, pays rent in a wad of cash he apparently still had enough of in his wallet that it wouldn't close properly and she doesn't even check his ID or do anything more than go 'cool, here's the living space.' Girl, this is how horror movies start. And yeah, this was supposed to be a horror movie in its way, but it wasn't a very successful horror movie. Horror book. Whatever. Especially since the plot is all wrapped up nice and neatly by a good old Deus Ex Machina villain. Oh, and apparently it's part of a two book series which I didn't know when I read it (since the ending itself was satisfying enough for me to just be done with it when I finished,) for which I'll be breaking my Must Finish The Series rule not only because it took 100 pages for it to get going and then wrapped up super quickly, but also because the ending I got after book one was good enough for me. There weren't any cliffhangers so dire that I absolutely needed to see if there was another book so I could find out what happened to X, Y, or Z. Between the Devil and the Deep Blue Sea falls firmly in the 'meh' range of book enjoyment for me. I wasted my time, but it was time I was going to be sitting around anyway so I'm not really upset about it. I don't feel the need to run out and consume everything else this author has written, but if something else comes across my desk, I won't throw it out immediately. It just won't be going to the top of any pile. Haven't read this, but will soon. Hypocritical narrators are absolutely the worst. And it's so hard to believe that someone could just accept the cash and let a strange guy live there. NO ONE DOES THAT.